Your salespeople are doing a great job drumming up business. But you are having a problem keeping up with demand and you can’t figure out why. Production holdups are increasing, quality standards are dropping, delivery schedules are not being met and your customers are becoming increasingly unhappy. Do you know what the materials costs are for a specific customer order? Do you know exactly what you have in inventory? Do you know what your year to date gross margin is? What open orders do you have on hand? Immediate access to this type of business data is critical to gain the valuable insight you need to effectively operate your business. Complete visibility over every aspect of your operation in real time is an absolute requirement, one that only an ERP system can give you. Having to wait until manual reports are generated slows the decision-making process and reduces the overall productivity of the company. Organic business growth tends to create silo’d departments each with their own systems and processes. Warehouse staff might track inventory on spreadsheets. The accounting department might run on QuickBooks and manually enter handwritten sales orders from the sales team. Purchasing might manually enter inventory data into their own database before being able to create purchase orders. Multiple systems running on multiple databases is a recipe for disaster. The potential for errors multiply as data from one database is manually transferred to another. Staff time is wasted on data entry and reporting which becomes a cost burden to the company. Essentially the company is operating at a much slower and unproductive pace than it should be. 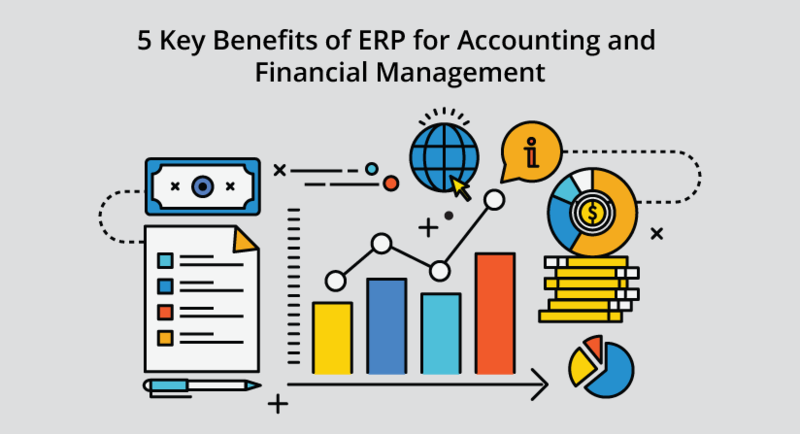 Whereas an ERP system integrates every business function into a single database providing complete visibility companywide. Information is accessible from every single department, errors are reduced, the staff is freed up to perform value-add tasks and the company runs at a much higher tempo. In addition, an ERP system can directly connect externally with both suppliers and customers. A direct connection with suppliers streamlines inventory and enables just-in-time manufacturing. A direct connection with customers automates the sales order process and mitigates delivery penalties. Inaccurate inventory records can adversely impact virtually every part of a manufacturing operation. Excess inventory uses up storage space, ties up working capital and can be damaged or become obsolete. Insufficient inventory can halt production lines, create expedited shipping costs and delay customer deliveries with a resultant decrease in customer satisfaction. An ERP system, in combination with barcode scanning, can accurately track inventory at multiple points in the journey from supplier to customer. For example, inventory at receiving, on the move, at specific locations, at appropriate points on the production line, at inspection points and in shipping can all be tracked providing greater visibility and accuracy. Errors and delays can be identified much faster. Absolute accuracy is virtually guaranteed, working capital is deployed with greater efficiency and most importantly customer satisfaction is significantly increased. This is particularly important for the apparel industry and enterprises that have multiple offshore manufacturing plants. If you don’t have an accurate picture of all WIP inventory, which may reside in multiple global locations for final assembly in one master location, then your sales team are unable to do their job and promise delivery times. Some ERP systems can accurately track many types of inventory including, raw materials, safety stocks, WIP inventory, subassemblies and finished goods across multiple locations. If you have accurate visibility of amount, type and location of inventory across your enterprise in real time, you can provide accurate delivery dates to your customers. Your manufacturing business lives or dies on your ability to make products profitably and deliver them on time. If you don’t know what raw materials you have on hand, what machines are available or if you have enough workers then you will be unable to meet customer demand. Some ERP systems have fully integrated Master Production Scheduling (MPS) modules which automate the process of having the right materials in the right place and the right amount in order to produce the correct quantities to meet your customer needs. It provides a crucial planning function which extracts actual supply and demand data, as well as forecasts, to deliver accurate and timely production plans. In today’s fast-paced environment your sales team need to be off-site visiting prospects and customers. A cloud-based ERP system will provide your sales rep remote access to pricing, availability and delivery information while in front of the customer or prospect. This immediate data access provides a significant competitive advantage and increases your sales teams close rate. It has never been a better time to invest in an ERP system. Cloud-based ERP systems for manufacturers are now well within the financial reach of a small manufacturing business. They require no investment in IT staff as all maintenance and upgrades are handled by the vendor. Increased flexibility and agility, the ability to scale your business, plus increased efficiency and productivity, all combine to provide significant ROI. If any of the warning signs outlined above sound familiar, then now is the time to consider an ERP solution.